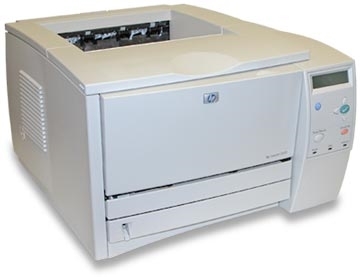 The LaserJet 2300 features a print speed up to 25 pages per minute and include a built-in 250-sheet tray, and one enhanced input/output (EIO) slot and two dual inline memory module (DIMM) slots for adding a network card, fonts, and memory to handle even the most demanding printing tasks—expansion slots accommodate an additional 256 MB of RAM for increased printing capacity and responsiveness. Media Weights Tray 1: 16 - 28 lbs. (main tray to output bin), 16 - 43 lbs. (main tray to straight-through media path) Tray 2, 3: 16 - 28 lbs.